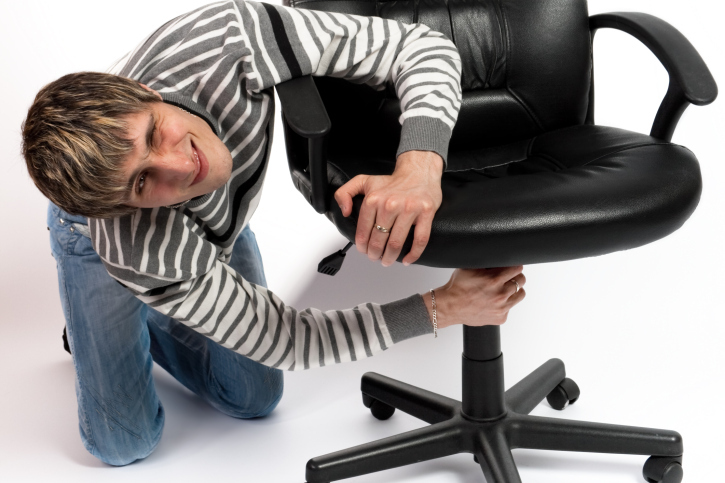 Occasional office chair maintenance will significantly extend the life of your investment. We write a lot about choosing the right office furniture, and how doing so can optimize your office layout. With all of the thought and care that went into choosing your chair, you want it to last you a good long while, don’t you? That’s where office chair maintenance comes in. Your office chair literally supports you all week long, so make sure you show it some appreciation with these tips. No, literally, the nuts and bolts. If your chair isn’t properly fastened where it needs to be, it can start to creak or feel less comfortable, which could in turn heighten the risk of causing back pain or having the chair flat out fall apart. None of those results are what you need from an office chair, so you should periodically check to make sure that nothing is coming loose, and if it is, fix it as soon as possible. Many modern office chairs have some combination of wheels, height adjustment, rotation mechanisms, and various other moving parts. All of these moving parts should be in smooth operating order to give you the most out of your chair. Wheels can pick up all sorts of dust, debris, or hair off of your carpet as you roll around, so make sure you clean those out every so often to keep it rolling. Other than that, you may want to occasionally add some lubrication to these moving parts to prevent squeaking or getting stuck. Cleaning consistently will improve the look and lifespan of your office chair. It’s recommended to vacuum your chair a couple times a month to get rid of dust and other allergens that may be trapped in the cushion. Additionally, a deep cleaning every so often will make your chair sparkle like new. Cleaning can maintain the comfort factor of your office chair for an extended period of time. Routine office furniture maintenance — not just your chair — is important in extending the life of your investment. If you have questions about proper maintenance for your particular office furniture, don’t hesitate to give us a call. This entry was posted on Thursday, February 25th, 2016 at 12:30 am. Both comments and pings are currently closed.